Please refer to our stock # R217 when inquiring. 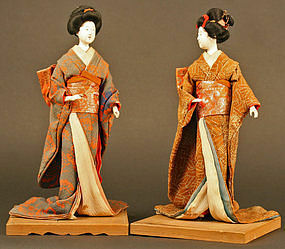 Lovely pair of Japanese Geisha Isho Ningyo. The style of this gorgeous set is fashioned after the work of early Japanese woodblock prints artists, such as Utamaro. They are finely painted and wear sumptuous kimonos over their graceful, elongated forms. Each figure is 12.5h x 7w inches, 32h x 18w cm. Excellent Condition.